New York–style, Neapolitan, New Haven, red, white, deep-dish, pan, flatbread. Any way you slice it, Americans love their pizza—to the tune of nearly $37 billion in annual sales, according to Technomic. But the industry that once thrived on phone delivery is evolving thanks to emerging fast casuals, expanding menus, and better ordering technology. The massive pizza market is decidedly mature, with 2015 industry growth barely expected to keep pace with inflation at 3 percent, according to Technomic. 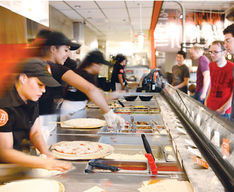 Executive vice president Darren Tristano says that, despite its nominal growth, pizza has several bright spots. Domino’s broadened its menu while keeping pizza at the core; some brands used discounting to focus on underserved, lower-income markets; and others refocused on quality, like Papa John’s. But the segment to watch, he says, is fast casual. The emerging pizza fast casuals are leveraging an integrated approach of preparing the product with the customer in real time by working the cooking element into the back end. The preeminent national owner, operator, and developer of shopping centers located in affluent and densely populated trade areas.